Splatoon might have launched with minimal content, but the game has received some commendable post-launch support over the past two months. New maps are steadily streaming in, coupled with some more modes, regular Splatfests more. But August is a big deal for the inky shooter. Nintendo promised it to be a few months ago, and they’re delivering on more fronts than expected. The biggest part of the free August update that Splatoon will receive has to be private matchmaking. Previously omitted for unknown reasons, you’ll now be able to setup custom games with all two of your Nintendo buddies –creating big 4v4 matches or woefully unbalanced 1v4 ones. That’s not the only server change too, as Squid Battles will also be introduced. As a variation on Ranked Matches, Squid Battles allow you to pair up with friends for entering ranked regions. A far cry better than being matches with random players. Complementing that is a big bump to the level cap, which increases from the measly 20 of old to a new higher of 50. The ranks in Ranked Matches have also changed, with Ranks S and S+ now incrementing on the standard A+. These new levels will give you access to more gear and weapons, the latter of which includes two brand new inky inventions. First up is a variation on the traditional Splat Roller. The bucket-esque Slosher manages to get even more ink out in a smaller area in front of you, with an impressive range if you adjust your angle of aiming a little bit. 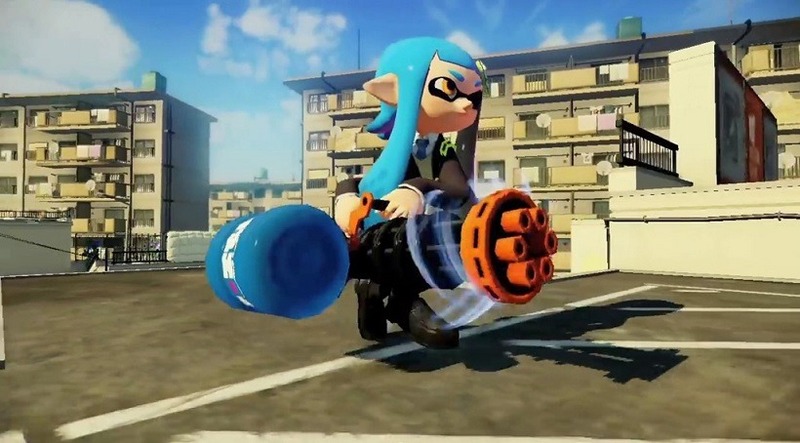 It’s unfortunately playing second fiddle to the Splatling – a massive inky gattling gun that looks like the beefiest, most powerful weapon in the game to date. Both will make their debut next month, and you can see them in some brief action below. Nintendo also promises a lot more content in the future, with proposed Rainmaker matches still to come, more heavy weaponry to choose from and even more clothing to kit your Inkling out with. If you haven’t yet picked up Splatoon, I think now is the time.